Neck and lower back problems with associated arm or leg pain. Sporting injuries and other spinal trauma. Spinal deformities including kyphosis and scoliosis. Dr Athanasiov has a busy private practice treating a wide variety of spinal conditions in both adult and paediatric patients. His practice incorporates the latest diagnostic and surgical techniques to provide safe, high quality treatment for spinal problems. Dr Athanasiov completed his Orthopaedic training in Queensland prior to subspecialist training at the Royal National Orthopaedic Hospital (RNOH) in Stanmore, UK. 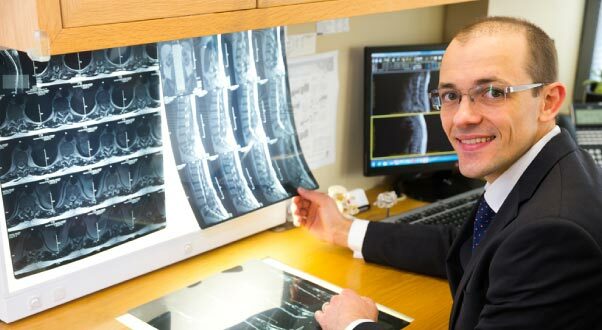 He has worked with world renowned Orthopaedic and Neurosurgical Spine Surgeons, gaining experience in spinal deformity correction as well as treatment for degenerative spinal conditions, spinal injuries and tumours. Following his training, Dr Athanasiov was appointed as a locum Consultant at RNOH where he managed a multi-disciplinary spine unit and trained registrars and junior doctors. He then returned to Brisbane to take up his current posts. Orthopaedic Registrar training through the Royal Australian College of Surgeons and the Australian Orthopaedic Association. Junior doctor and student teaching at Greenslopes Private Hospital. Senior Lecturer at the University of Queensland, teaching medical students and also providing training to allied health professionals, including physiotherapists. Through his private practice, Dr Athanasiov is pleased to offer patients assessment and treatment at Greenslopes Private and the Mater Private Hospital. He also conducts clinics in Darwin, NT on a regular basis.